I have a middle child. Of course, having three children means that there is a middle child. I knew that back before I had kids; I knew it when I was pregnant with number three. I just didn't realize how much being in the middle really makes you a middle child. When my first was born, she got my undivided attention for 3 years, and then after her brother was born, she got my undivided attention during all his long naps. When my third child was born, he got dragged around town to practices, lessons, and performances. He napped in the car, he ate jars of baby food in his carseat at soccer practice, and he practically lived in a stroller. But. he also got my undivided attention when the older two went to school. He still gets me all to himself every day, for 3 hours, since kindergarten gets out at noon. But the one in the middle always has his brother and sister around. He either gets lumped with his big sister (As in, "Let's get things done before the big kids get home") or with his little brother (as in, "Let's go do stuff while the boys are busy.") I have to make sure to make time for my middle boy. He needs it, and he sure deserves it. On the other hand, that means that when I can spend time with just him, it is special. We don't spend our alone time grocery shopping or folding laundry. We spend our time going out to lunch, playing Uno, or sneaking away for frozen yogurt. We laugh and laugh when we spend our time together. When he was born, we named him Collin. His big sister (at not-quite-three years old) declared, "I don't want to call him Coll-in. I want to call him Coll-moon." And somehow, it stuck. He became Moon or Moonie to us forevermore. And little did we know it, but it was a pretty good name for him. He is a bit moony. He is definitely my most emotional child (yes, more than his sister!). He gets the most frustrated, the most angry, and he definitely has the worst temper. But there is a flip side to that coin. He also gets the most elated, the most excited, and is the most caring. He is always happy to snuggle up on the couch, and almost always reaches out to hold my hand when we are walking together. He was born with a hole in his heart, (which according to the EKGs and echocardiograms is just a hair shy of closing itself) and sometimes I think his feelings just leak out whether he wants them to or not. He is such a worrier that I find myself worrying on his behalf, trying to make everything okay for him. He is also hilarious. Most often, when he makes a joke, it is more to himself than to anyone else. You have to listen carefully, but when you catch something he has mumbled out loud, you will almost always find yourself giggling. He is great at remembering a funny line from a TV show or movie that you have seen together, and quoting it back to you in just the right situation to give it a whole new life and meaning. He is amazingly smart, too. 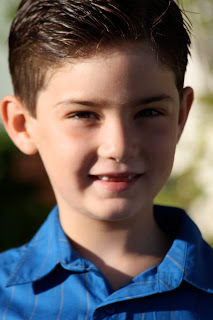 I don't always know what all is going on his little noggin because he isn't one to talk much, but he can answer any question his teachers have for him, and he sails through his school work. He will read a pretty tough book, to himself, and when I ask him about it he doesn't have much to say. "Was it good?" "Yep." "What was good about it?" "I don't know. I just liked it." "What was it about?" "A boy. I don't know." And yet, when he takes a computerized test on the book, he gets 100% of the questions correct. Every time. He likes to figure things out by himself. He doesn't want you to watch him trying to do something, until he feels like he is doing it right. He will watch his instructor or coach demonstrate something, and then he will walk a safe distance away to try it out himself. Only when he feels like he is doing it properly will he do it in front of his teacher. He doesn't much care what other people think of him. He is unique and not at all concerned about doing what is cool, or owning the right toys or wearing the right clothes or listening to the right music. If he likes it, he likes it. If not, he doesn't care about it one whit, no matter how popular it might be. 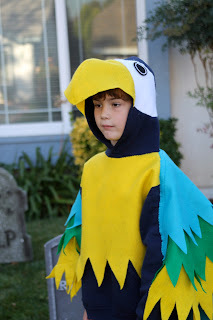 For Halloween, while most boys were superheroes or zombie/scary/dead stuff, he was a Macaw. And damn proud of it. When he's in the mood to talk, look out. It doesn't stop. Any thought that comes into his head goes right out his mouth, and it it usually things like the intricate details that differentiate one beyblade from another, or what type of bakugon can beat another. But when he isn't so talkative, there is no chance you are going to get anything out of him. This goes as far back as I can remember. One day when he was three, I picked him up from preschool. I asked what they talked about at school that day, and his answer was "Arctic animals. But I'm not going to talk about it." I sometimes worry that he had a hard time making friends, because he doesn't ask to have friends over after school, or to invite friends when we go places. I know he just needs his down time, though. He likes to spend time alone. Also, I will ask him what he did at school. "Played dodgeball." "Who did you play with?" "I don't know their names. Just some kids. Just the kids who were playing dodgeball." I am reassured by many people that this is just the way boys are, though. The game is far more interesting than the players. He had a birthday party at his Kung Fu studio, and had plenty of people to invite (I had to make him cut the list nearly in half), and they all came. I suppose I worry about him too much. At any rate, in my heart, I feel like he is going to be just fine. He is personable, funny, and thoughtful. He is smart and willing to work hard. He pays careful attention, probably most often when you least suspect it. He knows what to expect from the world, and he knows what the world expects from him. When he's in the mood to deliver, there is no stopping him. For his birthday, he asked for a lemon cake. He explained to me that he wanted something that his dad could share (he can't eat chocolate). He also requested lemon cupcakes (with green frosting) for his birthday party. He said he figured it would be easier for me if I could do it all at once. Unfortunately it didn't work out that well. I made the lemon cupcakes for his birthday party, which was Saturday. And then Sunday we were getting ready for a Superbowl party. In between making Momofuku's butter cake bars (more on those coming soon) and a seven-layer bean dip (more on that soon too! ), to take with us to the Superbowl, and more cupcakes to take to school to share with his class for today, I thought I would go ahead and make him his lemon cake at the same time, so we could have singing and candle blowing after dinner tonight. Only half came out of the bundt pan. Damn. I was about to cry or throw things or curse up a storm, when my husband wisely suggested I walk away from the cake disaster and enjoy the Superbowl. And so I did. Four hours and two hundred thousand calories of buffalo wings and guacamole and spinach-artichoke dip later, and I was ready to forgive the cake. So, as I write, there is a new lemon cake in the oven. I am giving it one more chance. If it works out, I will write about it tomorrow and give you the recipe. I have a lot of hope for it. It contains lots of sour cream and lemon juice and plenty of sugar. It has a yummy syrup drizzled over it while it is still hot, and the big chunks of broken cake that I munched on as I cleaned the kitchen last night were delicious. For now, though, I just wanted to write about one of my favorite guys in the world.